Had to get it all open and take a look. 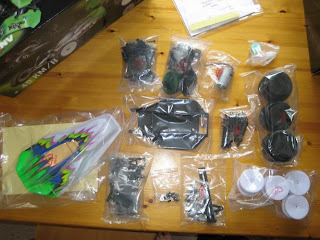 The car is well packaged like all Ansmann cars, the components look to be all of nice high quality plastics. I gave the chassis quite a twist to see how rigid it was and was really impressed that even with my manly brute strength the chassis plate remains solid. Contents look all as they should be. The only thing I have noticed is that the shocks are not Aluminium like it states on the box but plastic. Its strange as all the other Ansmann cars have aluminium shock tops / bottoms. I'll have to contact the shop to see whats going on. 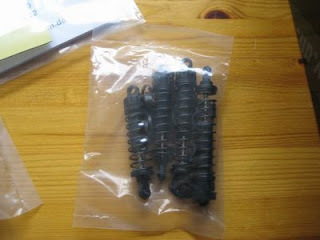 Ive been looking at the box and it shows 2 different types of shocks, some screw adjustable ones and others more like the std Ansman ones (green aluminium tops and bottoms, plastic cylinder). Theres no way that they would include the screw adjustable ones for this price, just want to enquire if the other type should be included. BTW I know its just bling, and the racer part of me knows that it probably wont make a difference, but the consumer part thinks that if it states Aluminium shocks I should get them.